Author Notes: Recipe is adapted from three different Auntie tenderloin recipes. I always double the Wine Sauce recipe. We serve this on Christmas Eve and enjoy the leftovers. Melt butter in saucepan with garlic on medium heat. Add onion and warm through, about 2 minutes. Remove about 4 tablespoons of onion & garlic and set aside. Continue to cook remaining onion/garlic mix. Add pepper and pint of mushrooms to sauce pan. Cook until mushrooms are softened, about 5 minutes. Remove as much of the mushrooms as possible, leaving remaining onion and garlic in pan. Set mushrooms aside with reserved onion & garlic. Add wine and soy sauce to sauce pan. Bring to simmer. Line a large roasting pan with heavy duty foil. Place tenderloin on top of onion bed. Heavily pepper the tenderloin and lightly salt. Cook in oven for 15 minutes. Spoon about 1/3 wine sauce over tenderloin. Reduce heat to 400 degrees. Add additional 1/3 wine sauce after 30 more minutes. Cook for a total of 1 ½ hours or when meat reaches internal temp of 140 rare, 160 medium, 170 well done. Remove from oven, move beef to carving board and tent with foil for about 20 minutes. Pour beef juices from roasting pan into wine sauce pan and bring to a simmer. Add reserved mushrooms, onions, and garlic and turn heat to low. Place roasting pan of sliced onions back in oven at 350 degrees for 20 minutes. 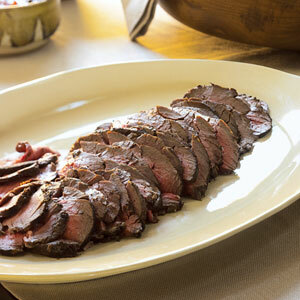 Slice beef and serve with wine sauce and roasted onion slices.